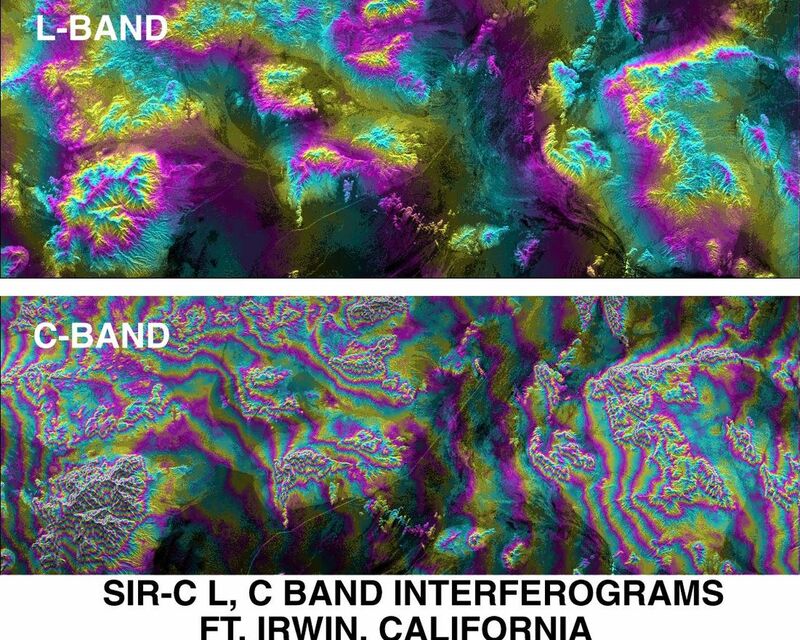 This image of Fort Irwin in California's Mojave Desert compares interferometric radar signatures topography -- data that were obtained by multiple imaging of the same region to produce three-dimensional elevation maps -- as it was obtained on October 7-8, 1994 by the Spaceborne Imaging Radar-C/X-band Synthetic Aperture Radar aboard the space shuttle Endeavour. Data were acquired using the L-band (24 centimeter wavelength) and C-band (6 centimeter wavelength). The image covers an area about 25 kilometers by 70 kilometers (15.5 miles by 43 miles). North is to the lower right of the image. The color contours shown are proportional to the topographic elevation. 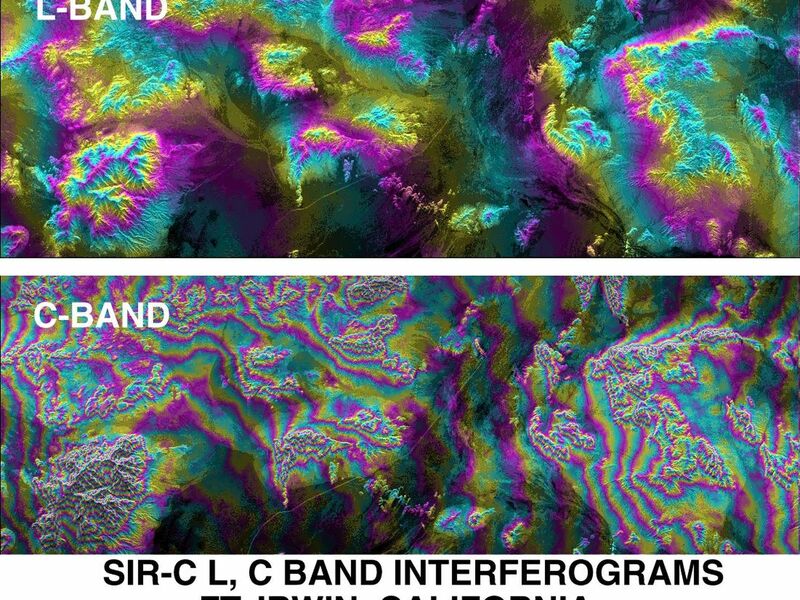 With a wavelength one-fourth that of the L-band, the results from the C-band cycle through the color contours four times faster for a given elevation change. 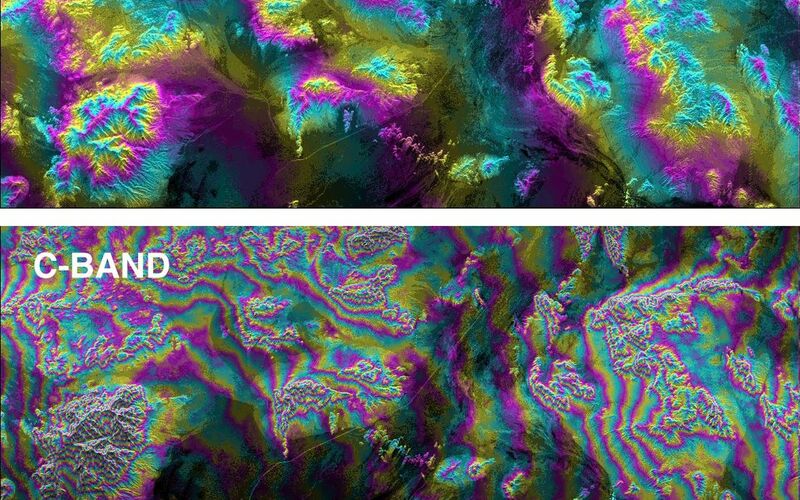 Detailed comparisons of these multiple frequency data over different terrain types will provide insights in the future into wavelength-dependent effects of penetration and scattering on the topography measurement accuracy. Fort Irwin is an ideal site for such detailed digital elevation model comparisons because a number of high precision digital models of the area already exist from conventional measurements as well as from airborne interferometric SAR data.